At Excellence Punta Cana you are secluded but not isolated. (JUNIORST) Room Amenities: Garden view or mountain view suite with four-poster king bed Private and furnished patio or balcony, full marble bathroom with a jetted whirlpool bathtub, separate shower, double vanities equipped with hairdryer, scales, vanity mirror, complimentary use of bathrobes and slippers, iron/ironing board, free Wi-Fi, air conditioning with in-room climate control, 27-inch satellite television, CD/DVD player, direct dial telephone, electronic in-room safe, coffee/tea maker, stocked mini-bar with beer, juices, soft drinks, water and snacks. (XCJUNIORST)The Excellence Club: The Excellence Club represents the ultimate in luxury, privacy, exclusivity and service. Private Lounge with Concierge Service 7:00 A.M. - 11:00 P.M.
Room Amenities: Garden View Suite with four-poster king bed located on the VIP floor. Private and furnished patio or balcony, full marble bathroom with a jetted whirlpool bathtub, separate shower, double vanities equipped with hairdryer, scales, vanity mirror, complimentary use of bathrobes and slippers, iron/ironing board, free Wi-Fi, air conditioning with in-room climate control, CD/DVD player, direct dial telephone, electronic in-room safe, coffee/tea maker, stocked mini-bar with beer, juices, soft drinks, water and snacks. (JUNIORSW) Room Amenities: Pool view suite with four-poster king bed. Direct access to pool and private furnished terrace with a hammock. Full marble bathroom with a jetted whirlpool bathtub, separate shower, double vanities equipped with hairdryer, scales, vanity mirror, complimentary use of bathrobes and slippers, iron/ironing board, free Wi-Fi, air conditioning with in-room climate control, 27-inch satellite TV, CD/DVD player, direct dial telephone, electronic in-room safe, coffee/tea maker, stocked mini-bar with beer, juices, soft drinks, water and snacks. (JUNIORTO) Room Amenities: Ocean view suite with four-poster king bed. Private and furnished patio or balcony, full marble bathroom with a jetted whirlpool bathtub, separate shower, double vanities equipped with hairdryer, scales, vanity mirror, complimentary use of bathrobes and slippers, iron/ironing board, free Wi-Fi, air conditioning with in-room climate control, 27-inch satellite TV, CD/DVD player, direct dial telephone, electronic in-room safe, coffee/tea maker, stocked mini-bar with beer, juices, soft drinks, water and snacks. (XCMASTER)The Excellence Club: The Excellence Club represents the ultimate in luxury, privacy, exclusivity and service. Room Amenities: Spacious pool view suite with two double beds and separate living area. Private and furnished patio or balcony, full marble bathroom with a jetted whirlpool bathtub, separate shower, double vanities equipped with hairdryer, scales, vanity mirror, complimentary use of bathrobes and slippers, iron/ironing board, free Wi-Fi, air conditioning with in-room climate control, 27-inch satellite TV, CD/DVD player, direct dial telephone, electronic in-room safe, coffee/tea maker, stocked mini-bar with beer, juices, soft drinks, water and snacks. (STEOV)Room Amenities: Ocean view suite with double balcony, king bed private and furnished patio or balcony, full marble bathroom with a jetted whirlpool bathtub, separate shower, double vanities equipped with hairdryer, scales, vanity mirror, complimentary use of bathrobes and slippers, iron/ironing board, free Wi-Fi, air conditioning with in-room climate control, 27-inch satellite television, CD/DVD player, direct dial telephone, electronic in-room safe, coffee/tea maker, stocked mini-bar with beer, juices, soft drinks, water and snacks. (XCJUNIORSW) The Excellence Club: The Excellence Club represents the ultimate in luxury, privacy, exclusivity and service. Room Amenities: Ocean view suite with four-poster king bed, with large private terrace or balcony. Full marble bathroom with a jetted whirlpool bathtub, separate shower, double vanities equipped with hairdryer, scales, vanity mirror, complimentary use of bathrobes and slippers, iron/ironing board, air conditioning with in-room climate control, CD/DVD player, direct dial telephone, electronic in room safe, coffee/tea maker, stocked mini-bar with beer, juices, soft drinks, water and snacks. (TERRSTE) Room Amenities: Spacious suites features expansive private terrace with comfortable lounge furniture, and an exterior Plunge Pool and spectacular front views of the Caribbean Sea. King bed, full marble bathroom with a jetted whirlpool bathtub, separate shower, double vanities equipped with hairdryer, scales, vanity mirror, complimentary use of bathrobes and slippers, iron/ironing board, free Wi-Fi, air conditioning with in-room climate control, 27-inch satellite television, CD/DVD player, direct dial telephone, electronic in-room safe, coffee/tea maker, stocked mini-bar with beer, juices, soft drinks, water and snacks. (XCJUNIOROV) The Excellence Club: The Excellence Club represents the ultimate in luxury, privacy, exclusivity and service. Room Amenities: Ocean view suite with four-poster king bed located on the VIP floor. Private and furnished patio or balcony, full marble bathroom with a jetted whirlpool bathtub, separate shower, double vanities equipped with hairdryer, scales, vanity mirror, complimentary use of bathrobes and slippers, iron/ironing board, free Wi-Fi, air conditioning with in-room climate control, 27-inch satellite TV, CD/DVD player, direct dial telephone, electronic in-room safe, coffee/tea maker, stocked mini-bar with beer, juices, soft drinks, water and snacks. (XCSTEOV) The Excellence Club: The Excellence Club represents the ultimate in luxury, privacy, exclusivity and service. Room Amenities: Spacious ocean view suite with four-poster king bed, with double patios or balconies. full marble bathroom with a jetted whirlpool bathtub, separate shower, double vanities equipped with hairdryer, scales, vanity mirror, complimentary use of bathrobes and slippers, iron/ironing board, free wireless internet, air conditioning with in-room climate control, 27-inch satellite television, CD/DVD player, direct dial telephone, electronic in-room safe, coffee/tea maker, stocked mini-bar with beer, juices, soft drinks, water and snacks. (XCJUNIORPL)The Excellence Club: The Excellence Club represents the ultimate in luxury, privacy, exclusivity and service. Room Amenities: Spacious (550 sq. ft.) Suites, offers king bed, a private and furnished terrace with plunge pool, comfortable lounge furniture and all the superior amenities for the Excellence Club. Fully equipped marble bathroom with a jetted whirlpool bathtub with separate shower equipped with double bath vanity, hairdryer, scales, vanity mirror, VIP toiletries and phone. Bathrobes and slippers for in-room use only, flat-screen TV, free Wi-Fi, air conditioning with climate control, radio/alarm clock and iPod connectivity, CD/DVD player, direct dial telephone, electronic in-room safe, tea/coffee maker, stocked mini-bar with beer, juices, soft drinks, water and snacks. Iron and ironing board, pillow menu, turn-down service and Excellence stationary. (XCTERRSTE)The Excellence Club: The Excellence Club represents the ultimate in luxury, privacy, exclusivity and service. Room Amenities: Front view of the Caribbean Sea, these suite offers a king bed with large private terrace and comfortable lounge furniture. The spacious (550 sq. ft.) Excellence Club Terrace Suite features an expansive terrace (452 sq. ft.) with plunge pool and spectacular front views of the Caribbean Sea. Room features include a fully equipped marble bathroom with a jetted whirlpool bathtub and separate shower equipped with double bath vanity, hairdryer, scales, vanity mirror, VIP toiletries and phone. Bathrobes and slippers, flat screen TV, free Wi-Fi, air conditioning with in-room climate control, CD/DVD player, direct dial telephone, radio alarm clock with iPod connectivity, electronic in room safe, coffee and tea maker, stocked mini-bar with beer, juices, soft drinks, water and snacks. Iron and ironing board, pillow menu, turndown service and Excellence stationary and all the Excellence Club amenities. (XCHNYSTE) The Excellence Club: The Excellence Club represents the ultimate in luxury, privacy, exclusivity and service. (XCNHYRTR)The Excellence Club: The Excellence Club represents the ultimate in luxury, privacy, exclusivity and service. Room Amenities: The spacious (953 sq. ft.) Excellence Club Honeymoon Suites with Rooftop Terrace features superior amenities including separate living room area with working table, walking closet, in-room round double Jacuzzi, fully furnished balcony with outdoor round double Jacuzzi, and an expansive (867 sq. ft.) private rooftop terrace with a hydro-spa pool and comfortable lounge furniture, open-air shower and impressive views of the Caribbean Sea. Bedding includes one king bed. Superior amenities include fully equipped marble bathroom with separate shower, double bath vanity, hairdryer, scale, vanity mirror, VIP toiletries and phone. Bathrobes and slippers, flat-screen TV, complimentary Wi-Fi, air conditioning with in-room climate control, radio/alarm clock with iPod connectivity, CD/DVD player, wireless telephone, laptop size electronic safe, coffee/tea maker, stocked mini bar with unlimited beer, juices, soft drinks, water and snacks. Iron and ironing board, pillow menu, turndown service, Excellence stationary and all the Excellence Club amenities. Additional Amenities: In-room check in and check out, butler service for luggage, special Jacuzzi decoration (must be booked through concierge) and express ironing (one outfit per person/stay). Located on the east coast only 30 miles/48 kilometers from the Punta Cana International Airport and 46 miles/74.7kilometers from La Romana International Airport. 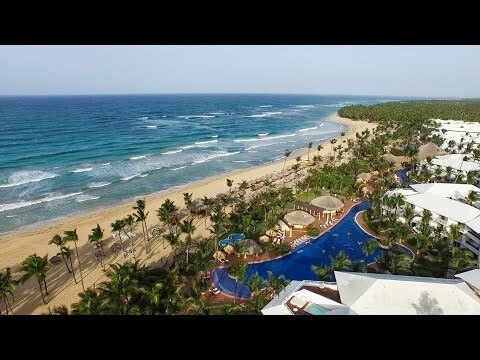 Excellence Punta Cana celebrated recognition for achieving the Top 25 All-Inclusive Resorts in the Caribbean at TripAdvisor Travelers Choice Awards 2019. This all-adult all-suite resort is surrounded by a beautiful palm grove on the east coast of the Dominican Republic; bordering on a beautiful Caribbean beach. Regular Rooms Include: Garden view or mountain view suites with four-poster king beds or two double beds. Private and furnished patio or balcony, full marble bathroom with a jetted whirlpool bathtub, separate shower, double vanities equipped with hairdryer, scales, vanity mirror, complimentary use of bathrobes and slippers, iron/ironing board, free Wi-Fi, air conditioning with in-room climate control, 27-inch satellite television, CD/DVD player, direct dial telephone, electronic in-room safe, coffee/tea maker, stocked mini-bar with beer, juices, soft drinks, water and snacks. For your unlimited domestic and international drinks choose from the lobby bar, coffee bar serving ice cream and pastry treats in the afternoon, swim-up pool bar, pool and beach bar by the main pool, Cascade pool bar, disco bar, sports bar, casino bar, chill-out bar at the beach, theater bar and 24-hour room service. The Lobster House: Provides Breakfast A La Carte and Lobster Specialties for A La Carte Dinner. Spa discount cannot be combined. One discount applies per treatment. Spa discount can be redeemed directly only at Spa of the hotel. The discount apply only in treatments and or massages. The Spa discount cannot be used for purchases in the boutique of the Spa. Spa discount are not transferable, cumulative and cannot be combined with any other promotion of the Spa. Celebrate your Honeymoon and Anniversary in Paradise. You have two options to choose from. Special Notes: The Honeymoon or Anniversary Package is complimentary with your stay at Excellence Resorts. Guest must request it at time of booking and will be required to present a copy of the wedding certificate at time of check-in. Selling Price: $600 USD per couple (pay directly to the hotel). Special Notes: Gratuities included. The Excellence Honeymoon or Anniversary Package is complimentary for stays of minimum seven nights or more in an Excellence Club Junior Suite Ocean View or higher category. Wedding Packages: Please contact wedding coordinator at weddings.puj@excellence-resorts.com.